36 posts categorized "Church & Holocaust"
But the Pope's autobiography says he was a Hitler Youth member. Rabbi Sholom DovBer Wolpe, leader of Chabad's messianist faction in Israel, condemns Church and Pope. But the attack is ridden with errors and shows a clear disregard for truth. Pope admits he mishandled Holocaust-denying bishop. The Pope will pray at the Holocaust memorial at Yad Vashem, but refuses to enter Yad Vashem's Holocaust museum. "The Holy Father wants to save his children, including the Jews, and orders that hospitality be shown to these persecuted people in the convents." PBS aired a documentary tonight called Escape From Auschwitz as part of its Secrets of the Dead series. McLelland and Stewart in Canada. financier in 1938 was not Jewish! You can read Sir Martin Gilbert's review of Rabbi David Dalin's book by puchasing the American Spectator at your local newsstand or by reading it in your local public library. Gilbert is perhaps the world's leading historian on both WW2 and the Holocaust. What will Church-haters like Beyond BT's Steve Brizel and, of course, DovBear, do with this shining endorsement of Pius? My guess? (And this is only that – a guess.) Continue to hate at all costs. After all, that is what bigots do. UPDATE: I have uploaded scans of Sir Martin Gilbert's review here. In March 1939, many Jewish newspapers in the United States, Canada, Great Britain, and Jerusalem welcomed Pope Pius's election and described him as a friend of democracy. In an editorial (March 6, 1939), The Palestine Post, the predecessor of The Jerusalem Post, observed, "Pius XII has clearly shown that he intends to carry on [Pius XI's] work for freedom and peace...we remember that he must have had a large part to play in the recent opposition to pernicious race theories and certain aspects of totalitarianism..."
On October 27, 1939, the pope's first encyclical, "Summi Pontificatus," was made public. The American Israelite in Cincinnati (November 9, 1939) asserted that the encyclical "contains a ringing denunciation of all forces which put the state above the will of the people, a condemnation of dictators and disseminators of racism who have plunged the world into chaos." On January 26, 1940, the Jewish Advocate in Boston reported, "The Vatican radio this week broadcast an outspoken denunciation of German atrocities and persecution in Nazi [occupied] Poland, declaring they affronted the moral conscience of mankind." This broadcast graphically described atrocities against Jews and Catholics and gave independent confirmation to reports about Nazi atrocities, which the Reich previously dismissed as Allied propaganda. On March 14, 1940, London's Jewish Chronicle commented on Pius's five conditions for a "just and honorable peace," which he articulated in his 1939 Christmas message. The Jewish Chronicle described the pope's conditions, especially the protection of all racial minorities, as a "welcome feature," and praised him for fighting "for the rights of the common man." In the same month, Italy's anti-Semitic laws went into effect, and many Jews were dismissed from the government, universities, and other professions. Pius XII responded by appointing several displaced Jewish scholars to posts in the Vatican library. In an editorial, the Kansas City Jewish Chronicle (March 29, 1940), concluded that the pope's actions showed "his disapproval of the dastardly anti-Semitic decrees." ON AUGUST 28, 1942, the California Jewish Voice hailed Pius XII as a "spiritual ally" of Jews after noting that the Vatican, through its diplomatic representatives, protested the deportations of Jews from France and Slovakia. On April 16, 1943, the Australian Jewish News published a brief article about Pierre Cardinal Gerlier of Lyon, France who protested the deportations of French Jews. The newspaper quoted the cardinal as saying that he was obeying Pius XII's orders by opposing the Vichy regime's anti-Semitic measures. 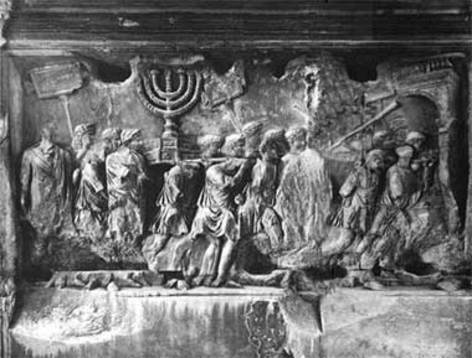 On October 17, 1943, the Nazis began to arrest Jews in Rome. On October 29, 1943, the Jewish Chronicle wrote, "The Vatican has made strong representations to the German Government and the German High Command in Italy against the persecutions of the Jews in Nazi-occupied Italy..."
Along with the Vatican's protests, thousands of Jews found refuge in Rome's convents, monasteries, and the Vatican itself. In June 1944, the Allies liberated Rome, and Pius XII protested the deportations of Hungarian Jews. "With Rome liberated, it has been determined, indeed, that 7,000 of Italy's 40,000 Jews owe their lives to the Vatican," the American Israelite (July 27, 1944) editorialized. "Placing these golden deeds alongside the intercession of Pope Pius XII with the Regent of Hungary in behalf in behalf of the Hungarian Jews, we feel an immense degree of gratitude toward our Catholic brethren." Government sources have called statements made by a senior Vatican official condemning the silence of the Holy See during the Holocaust "unprecedented." Sources in Jerusalem said it is still too early to tell whether the statements made Tuesday by Father Pierbattista Pizzaballa, Custos of the Holy Land, reflect a change in Vatican policy about the silence of Pope Pius XII during the Holocaust. Speaking in Hebrew at a conference at Tel Aviv University on the actions of the Church during the Holocaust, Pizzaballa criticized "church leaders, including those of the highest level, who did not adopt a courageous stand in the evangelical spirit in the face of the Nazi regime." Pizzaballa said that after the Holocaust, the Church struggled with "the question of how it failed at the task of molding the conscience of the faithful so they would refuse to cooperate with the Nazi machine of destruction. How so many of the faithful cooperated and even more stood and did nothing." Pizzaballa added that the 1965 Vatican declaration absolving the Jews from killing Jesus was a "response to the deep crisis created after World War II." He said the Church subsequently had made a number of far-reaching changes, among them emphasizing the Jewish identity of Jesus and recognition of the Hebrew Scriptures as an inseparable part of Christian tradition, and that "preachers and the greatest of teachers" had presented Jews in a distorted way, which laid the groundwork for modern anti-Semitism. "I cannot avoid the horrific thought that if Jesus were alive in the Holocaust, he would have been condemned to the same fate as the Jewish people, as would his mother, his family and his disciples." Pizzaballa said. Rabbi David Rosen, a member of the Permanent Bilateral Commission of the State of Israel and the Holy See and brother of Rabbi Jeremy Rosen, does not believe this indicates a change in Vatican policy. Rabbi Rosen argues that Father Pizzaballa is simply more attuned to Jews because of living in Israel and his familiarity with Jewish and Israeli culture. That accounts for what appears to be a more wide-reaching statement. Will Pious XII be beatified? Should we as Jews care? And does it matter that 85% of Italy's Jews survived the Holocaust, many of them under the protection of the Church? Later, in 1943, the surviving members of my mother's family were forced to flee France for Italy. By then, my mother's mother was pregnant with her first child, and a Catholic priest arranged for refuge for the family in villages around Cuneo, Italy. The men were with the partisans fighting the Nazis and fascists, with the women and children hidden elsewhere. Two years ago, I was speaking with a Yeshiva University rosh yeshiva about a halakhic matter. Suddenly, while commenting on the Catholic Church's view of an issue, the rosh yeshiva blurted out, "The Pope, yemach shemo, …." ["The Pope, may his name be blotted out," a traditional curse reserved for the greatest enemies of the Jewish people, like Hitler and Haman, now directed at Pope John Paul 2, the Pope who had done the most to restore relations with the Jewish people.] Can one imagine Rabbi Joseph Ber Soleveitchik speaking about the Pope this way? I wonder how many anti-Nazi gentiles the Va'ad Hatzalah saved? How many retarded? How many Gypsies? Actually, I know the answer: zero. You would think the Va'ad along with Lubavitch and the other Orthodox groups would have saved a few of the non-Jews who were also targeted by Hitler. But they did not. Why? 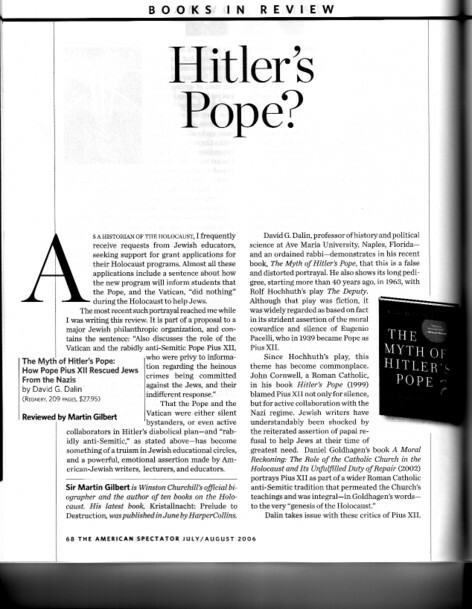 For more background on the issue of the Church and the Holocaust, read David Dalin's book, The Myth of Hitler's Pope. Does anyone know what attempts, if any, were made to save mentally ill, disabled and retarded Jews during the Holocaust? We know of rescues of a few important people, rabbis and community leaders. Were any disabled or retarded people rescued? Are their stories in print? Does anyone know? Please cite sources. Thank you. [I]t seems fairly certain that [Pope Pius 12th] was, overall, a strenuous defender of Jews who saved tens of thousands, maybe hundreds of thousands. While 80 percent of European Jews were murdered in the Holocaust, 85 percent of Italian Jews survived, thanks in large part to the Vatican’s efforts. 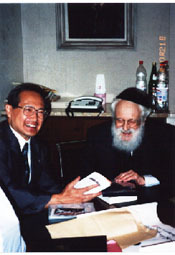 [Rabbi David] Dalin includes references to numerous papers from the Vatican, along with memoirs of Holocaust survivors and non-Jewish rescuers, showing that Pius directly ordered church representatives across Europe to hide Jews and provide other forms of material sustenance, including cash. In Hungary alone, 170,000 Jews evaded Auschwitz because of Pius’ personal intervention. UPDATE 1: It seems the new issue of First Things has an article written by a cardinal explaining the Catholic theology underlying the Vatican's reapprochment with the Jewish people. The upshot of the article is apparently this: The Catholic Church does not advocate the conversion of Jews, but – and here lies the nub of the issue – it believes that in the End of Days, Jews will accept Jesus as their messiah. This riles some Jews (for example, see comments to that post), and, for some of those, it is enough to justify continued hatred of the Church. This is foolish (and hypocritical) on many grounds, not the least of which is, in the End of Days, we expect Catholics and other non-Jews to accept the Jewish God (although not become Jewish) and reject their current theological beliefs. But let us look at Judaism's theology – as expressed by Jewish law – regarding non-Jews. Compared to the Church, we're raving antisemites. The Catholic Church should categorically reject any attempts to convert Jews, the American Jewish Committee's Rabbi David Rosen said Thursday. "Even though the Nostra Aetate says that no attempts should be made to convert Jews, many Catholics continue to express a hope for conversion," he told The Jerusalem Post from Rome during the Vatican's 40th anniversary celebration of the Nostra Aetate document, which revolutionized the Catholic Church's relations with Jews. Rosen, the AJC's international director of interreligious affairs, has been involved in Vatican-Israeli negotiations for more than a decade. He and Cardinal Jean-Marie Lustiger, a retired Paris Archbishop and Jewish convert, were to be the keynote speakers Thursday evening. Cardinal Walter Kasper, president of the Holy See's Commission for Religious Relations with Jewry, is hosting the event. The Nostra Aetate was one of the key documents to emerge from the 1962-65 Second Vatican Council meeting of Catholics and clergy that modernized the Catholic Church. In it, the Vatican deplored anti-Semitism in every form and repudiated the deicide charge that blamed the Jews for Christ's death. prominent Church theologians such as Kasper consider any attempts to convert Jews, even unobtrusive invitations, inappropriate and unnecessary. "But some theologians, like Cardinal [Avery] Dulles interpret the Nostra Aetate differently," he said. "Although they eschew proselytizing, they hold that an open invitation to convert is permitted." Rosen said differences of opinion on conversion of Jews might stem from varying theological positions on redemption for Jews. Catholic theologians who hope for the conversion of Jews believe that although Jews are not condemned by God, they are not in His favor. Therefore, it is legitimate to hope for Jews conversion to Catholicism. Those who reject conversion as inappropriate and unnecessary would be more likely to accept the idea that Jews are eligible for spiritual redemption in the world to come, he said. Notwithstanding his criticism on the issue of conversions, Rosen called the Nostra Aetate a "mind-boggling revolution in the Catholic Church's theology." "This might sound like a hyperbole, but there is nothing quite comparable in the history of humankind," he said. "Imagine a billion followers who had been taught contempt for the Jews and Judaism, who had been inculcated with the idea that the Jew was in league with the devil, suddenly being taught that the Jews are the people of the covenant. 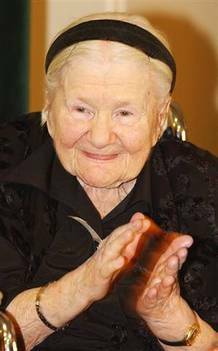 Or as Pope John Paul II put it, the Jews are 'our dearly beloved older brother.'"